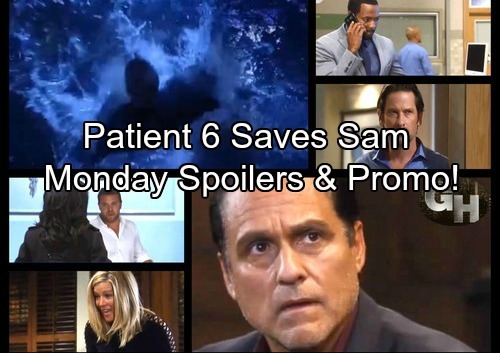 General Hospital (GH) spoilers for Monday, October 30, tease that Patient Six (Steve Burton) will pull off a daring rescue. Dr. Klein (Gene Farber) just tossed Sam (Kelly Monaco) in the water, so it’s time for classic Jason to take action! He’ll dive in and save Sam from a grim fate. Meanwhile, current Jason (Billy Miller) will try to track down Sonny (Maurice Benard). He’ll be desperate to find out anything that could lead him to Sam’s location. Before Jason has a chance to grill Sonny, it’ll be Carly’s (Laura Wright) turn. She’ll demand to know what happened between Sonny and Patient Six. Carly can tell that they met up before the party shocker, so she’ll want the truth. Sonny will decide to give it to her, but she won’t be ready to accept it. General Hospital spoilers say Carly won’t buy the idea that this guy is Jason. She’ll try to convince Sonny that he’s wrong, but he’ll continue to support Patient Six’s claims. Across town, Griffin (Matt Cohen) and Ava (Maura West) will rehash what transpired at the shocking shindig. Ava will marvel at the way Patient Six crashed through the skylight. Once they debate what’s to come, they’ll head off for some quiet time. Ava and Griffin could certainly use a break from the drama. Elsewhere, Monica (Leslie Charleson) will fill Liz (Rebecca Herbst) in on the latest chaos. She’ll visit Liz’s room and insist that some lunatic abducted Sam. An intrigued Franco (Roger Howarth) will eavesdrop nearby. He’ll do his best to connect all the dots, but he won’t be able to figure out much just yet. Andre (Anthony Montgomery) will also get a frustrating phone call. Perhaps Dr. Klein (Gene Farber) will provide updates on the botched plot. It’s clear that Andre is dealing with a very incompetent team. GH fans still don’t know who Andre’s boss is, but he or she won’t be happy! Other General Hospital spoilers say Josslyn (Eden McCoy) will get suspicious. Oscar (Garren Stitt) and Joss will don some fun Halloween costumes, but their evening will take a surprising turn. Maybe Josslyn will suggest showing Oscar’s mother their wacky get-ups. If he advises against it, that should lead to some questions. For starters, Josslyn will ask why Oscar doesn’t want her to meet his mom. She may point out that Oscar has been pretty secretive about Kim. Oscar will look highly uncomfortable, so he must be hiding something. What is it about Kim that Oscar doesn’t want revealed? It’s possible that Kim has some crazy connections in town, but why did they move to Port Charles if she’s determined to avoid everyone? We’ll keep you posted as other GH news comes in. Stick with the ABC soap and don’t forget to check CDL often for the latest General Hospital spoilers, updates and news.